Tasting - no charge. Wine by the glass $4.50. Cheese and crackers. Tasting - no charge. Wine by the glass $5.00 (one glass on guided tours only). Cheese and crackers. Heather and Gary Kennedy. Due to a fire only 2 whites and 2 reds presently available. Lounge: $6.00 glass, cheese and crackers $5.00. Picnic area: Glass and purchased bottle. Tasting - no charge. Wine by the glass $6.00/glass. Cheese and crackers. 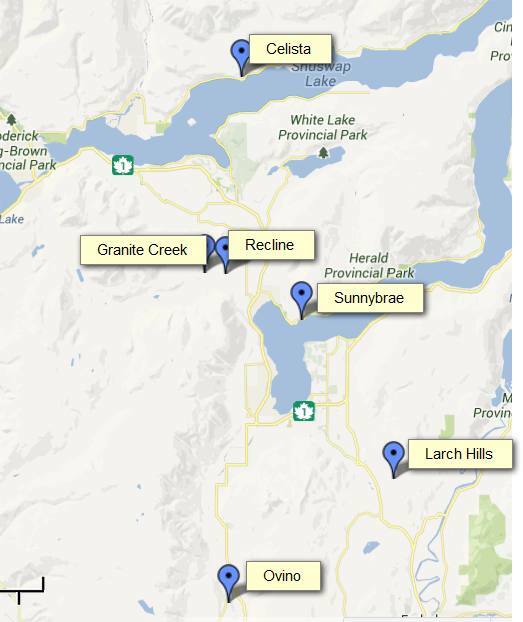 Then click on "Shuswap Wineries" Expand for detail.